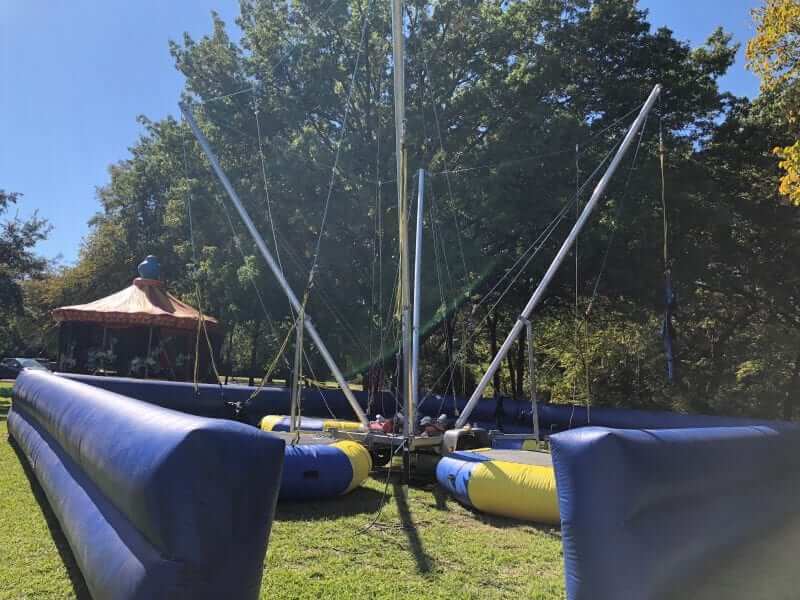 Take your party to new heights with our bungee portable trampoline rental. At Starwalk of Dallas, we provide high quality, yet affordable, inflatable rentals to the entire DFW metroplex. This bungee jump rental will send your guests soaring 24 feet in the air. This makes it perfect for the adventurous kid or the adrenaline seeking adult. Our mission is to provide you with a safe, easy and most importantly, EPIC, bungee jump trampoline rental experience. All of our equipment is inspected by regulatory authorities. Our employees are trained in proper safety protocol. We pride ourselves in having the cleanest rentals. We have a flexible scheduling policies and a second-to-none customer service. Just click on our trampoline rental and our customer service team will quickly send you a FREE quote. Jump sky high….The rider is first centered on one of our inflatable trampolines. Then the rider is secured in a custom, adjustable, padded harness by a trained operator. Additionally, a combination of power cords and an electric winch allows the jumper to jump up to 24 feet in the air! This combination of bungees and lift enhances the jumpers’ ability to perform front and back somersaults as well as reach heights that are thrilling. Minimum rental 2 hours. Separate vehicle delivery charge may be required. For setup, a stable hard surface is required to set up the trampoline. The area required is 30×30 feet. Starwalk of Dallas offers an inflatable border wall for security. As an alternate, we may block off the perimeter with neon orange netting for security reasons. We ask that players wait behind the security fence prior to their turn. When it is time for a rider, the rider is fitted into a harness. The harness is secured and tightened by a trained staff member. The rider is then escorted to the quad pod and the riders weight is obtained. The staff member will adjust the bungee cords based upon the riders weight. This is done to ensure the proper bounce for the rider. Once the bungee cords are adjusted, the player will stand on the mobile trampoline. The riders harness is then attached to the bungees. Our staff then slowly tightens the bungees to add tension to the bungee cords. This allows the rider to be raised slightly off the mobile trampoline. As the player begins to jump higher, the bungees allow the player to safely fly through the air. More experienced riders attempt tricks like summersaults and back flips while touching down on the trampoline between each jump. 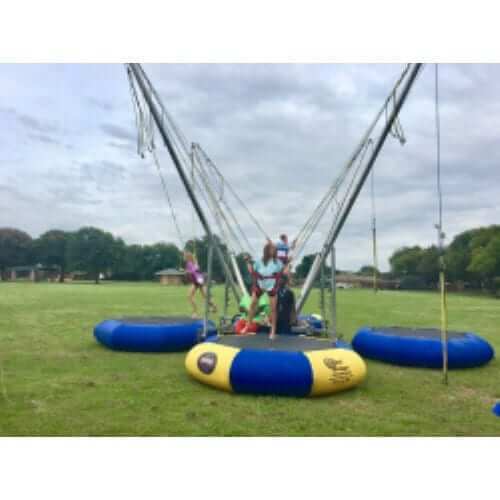 This portable trampoline rental is a great addition to festivals, church events, school carnivals and so much more. For a great large event consider the Amazon Zip Line, Wrecking Ball, Delta Force obstacle course and bungee trampoline. 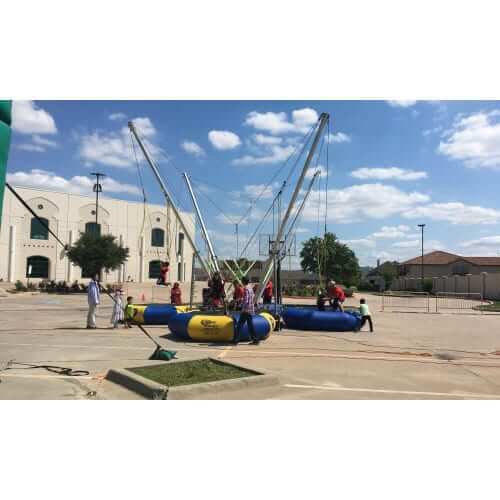 With one of the widest selections of party rentals in Dallas, from inflatable obstacle courses to water slides to dunk tanks, we’re fully equipped to handle any sized event. We’re large event specialists and have delivered to corporate picnics, school carnivals, community festivals, church events, and more. We even offer discounts pricing and bundles for large events. 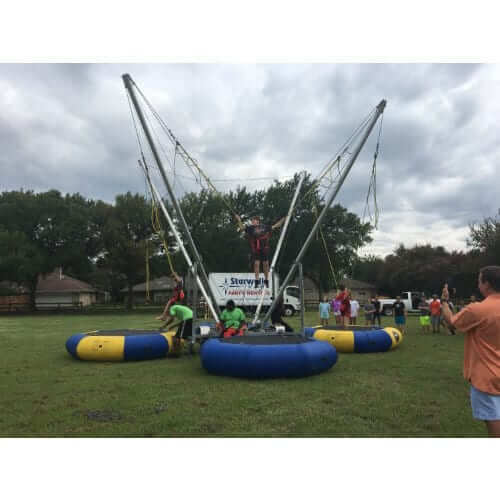 Contact us now at (214)-340-6666for a FREE quote on our party trampoline rentals. The party rental industry is highly unregulated and some companies aren’t educated on industry standards or safety practices. At Starwalk of Dallas, safety is our first priority. All of our equipment is inspected by regulatory authorities and sanitized before every use. Our employees are also required to undergo training before they’re allowed to set up any equipment. At Starwalk of Dallas, we understand how stressful the party planning process is, which is why we make it as easy as possible. We’re a full-service amusement and inflatable party rental company. This means we handle everything from delivery to installation to tear down, or even helping you plan your event if you’re having trouble. After booking our trampoline rental, it will be delivered to your location and will be quickly set up by our crew of experts. We do all the heavy lifting and transportation, so you can focus on having fun.